Learn how to change your settings in the campus CMS. 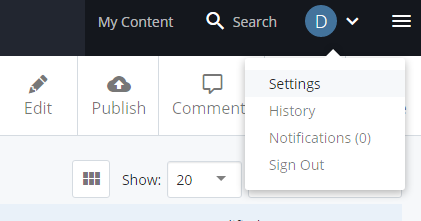 From any screen in the CMS, click on your profile icon and select Settings from the menu. Click Submit in the top-right corner to save your changes. Make sure that: "Unpublish on Move / Delete" is checked.This helps prevent stranded pages. Default Site: Set a site for your dashboard widgets to use. Change Profile Photo: Upload a new profile image. This will replace the default avatar and appear next to any comments you leave on a page.